Is Your Builder Choosing the Right Housing Materials? The right building materials, like the right location or style of home, is subjective. A good way to determine if your builder is choosing the right materials for your house is to communicate what you want, where and at what cost. Where the house is located may be a strong factor in what materials to use. A good siding choice in the desert may be a bad choice for a suburban Chicago home where climate fluctuates often. Homeowner style varies greatly too. What is beautiful to one may be ugly to another. How a material feels is important to some people. Cost is relative too. Consider lifecycle costs as well as sticker price. Material maintenance and longevity may add to or reduce demands on your wallet and time. Energy efficiency and recyclability may also be important considerations for some people. At the least, discuss material choices for your roof, siding and deck with your builder. Putting a roof over one’s head is a primary objective for most people. The cost of roofing depends on the material used, the size of the roof, and the cut of the material —either shake or shingle. The most popular roof material (used on about 75 percent of houses) is asphalt or fiberglass composite shingles. This is an inexpensive and easy to install choice – durable, fire resistant, low maintenance and with good curb appeal. Styles and color choices abound. While wood shake roofs offer a nice aesthetic appeal, regular maintenance is required to prevent mold, rot and insect infestation. Shakes also are costlier than other materials. Clay tile and slate roofs are distinctive looking and expensive as well. Their long lifespan and low maintenance may be appealing enough to withstand the initial cost – which is high. One caveat is to make sure the walls can support the weight of this style of roof. Walking on these materials may also be risky because they can break. Metal, rubber or cement tiles are newer roof material choices. Each of these materials presents a different aesthetic, lifecycle and price. Technology improvements have overcome some of the initial problems experienced with these materials. Metal can be noisy when it rains. When exploring roofing options, ask your builder what material will be used for roof decking, rafters and other framing material as well. Siding materials include choices of wood, brick, aluminum, vinyl, plastic, fiber cement, composite wood, stone or stucco. Assess your priorities. Is fire resistance important? What about energy efficiency, cost, warranties and longevity forecasts? Do you need a low maintenance solution or is curb appeal more important? Fiber cement and composites look like wood, wear well and last a long time. Because both hold paint well, while resisting rot and impacts from hailstorms or high wind, they are sustainable, “green” products Vinyl is easy to maintain and inexpensive, but can crack in cold weather and may fade over time. Aluminum siding is fairly easy to maintain and lasts a long time but may lack curb appeal and durability. Wood is pricey. It requires routine maintenance. Brick and stone veneer siding or stucco may be good choices for a particular style of home, but do require regular maintenance. Pressure treated pine is a popular choice for decking with it being installed in nearly 80 percent of existing decks. However, non-wood materials including vinyl and plastic composites are other choices. When engineered well, these can be a lower maintenance alternative to wood, but typically are significantly more expensive and require scrubbing to prevent mildew. Pieces of the fastening systems can be affected by temperature changes. Wood offers the aesthetic and durability most people prefer. Decks can be built in all shapes and sizes. Include the grades, widths and type of treatment when determining costs. Ask your builder for a sample of the material to be used so you can get the actual feel of it. There are so many options when deciding on the right building materials for your house. Work with a builder who understands what will work best for your style, your location and your wallet. At Newport Cove we build roofs using architectural asphalt shingles that come with a lifetime warranty. 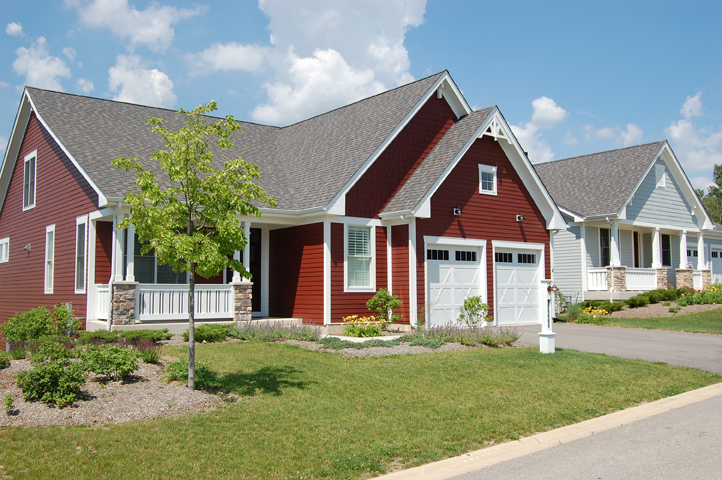 Our siding is made of fiber cement or composites that have multi-decade warranties. 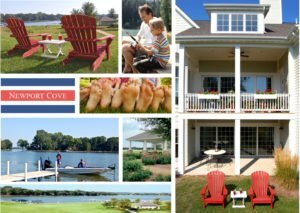 Our decks are built with no-maintenance, treated lumber, but many homeowners upgrade to the new composites. We are located on the Chain O’ Lakes, within commuting distance to downtown Chicago. See how beautiful and durable our housing materials are. Come for a walk- through by appointment during the week or anytime between noon and 4 pm. on weekends. ← Is Your STUFF Stressing You Out?